Target had a display of e.l.f. mineral make up a month or two ago, and because I'm always looking for something to give me a flawless finish, I picked up the Booster Face Translucent Mineral Finishing Powder. This kit contains 1 booster powder (0.17 oz./4.8 g.) and a blending brush. This kit was priced at a reasonable $4.99, so I thought if it didn't work out, I wasn't out too much money. I have never used e.l.f. products other than their eye lash curler, which is the best I've ever used. I also recently ordered some brushes, primarily to get some more concealer brushes for cuticle clean-up, but that ordering process and their customer service have greatly disappointed me. But, I'll save that review and ordeal for another day! 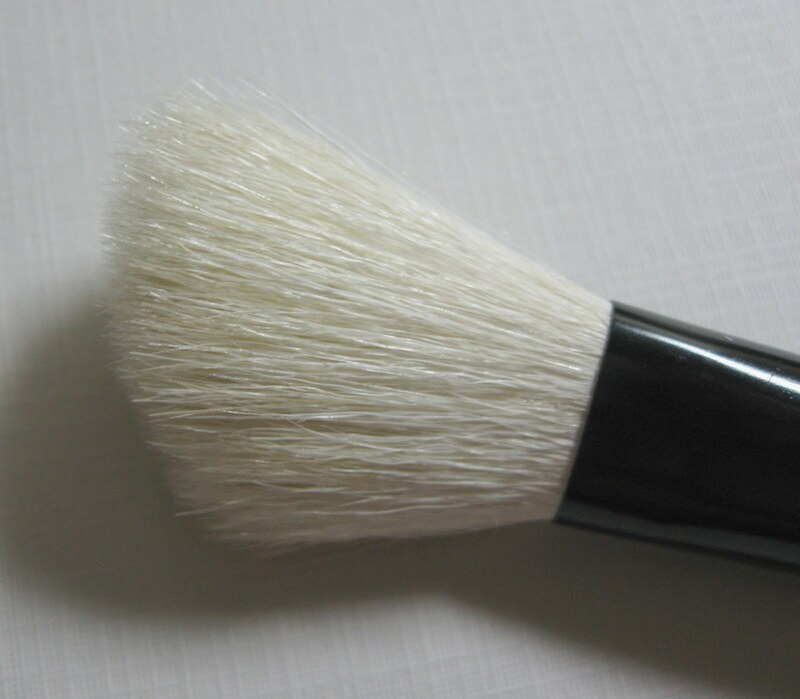 The blending brush is not dense enough to get a good application of the powder, so I use a kabuki brush for my application. The e.l.f. brush does a good job of picking up plenty of product though, and because the bristles are not densely packed, it works very well on some of my more pigmented blushes. This allows me to place these blushes more evenly without getting too much color on. I personally like to buff and blend mineral products, and I feel that a kabuki works better for me with these types of products. The color I chose is called "sheer", and while the packaging says translucent, this does have more color to it than I thought it would. My plan was to use this over my foundation, but I've been wearing it alone and am very happy with the outcome. It adds enough color to even out my skin tone, but it has a light coverage that feels very natural. The brush is average when if comes the softness factor, but as I mentioned, the bristles are not dense enough to do a decent job of blending. You can click on the ingredients to read them better, and they are 100% natural with no parabens, preservatives, or chemical dyes. This is a nice little kit for the price, and even though I can't use the brush for the purpose intended, it is useful for other applications. The finishing powder itself works well alone, and I'm sure it would do a good job over foundation also. I recently started wearing liquid foundation for the first time, but I find with the warmer temperatures and some sun/tan on my face, I'm reverting back to just using a powder foundation. 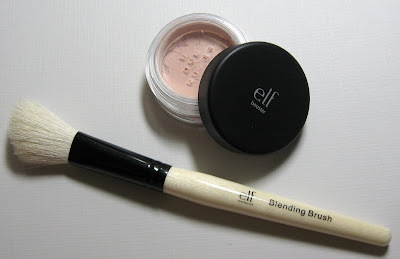 MAC msfn is what I've used for quite a while, but I'll definitely be using the e.l.f. product quite a bit during the summer months. I like the "barely there" natural look that it gives, the light feel, and the oil control it provides, giving my skin a dewy look. It's nice to find a product at this price that doesn't look too powdery or cakey, but still controls the oil. Never having used their color cosmetics before, if you have any recommendations for other e.l.f. products you like, I'd love to hear about them! thanks for the review! i have a few e.l.f. products, i like some of their brushes, but not all! their flat top Kabuki is awesome! I use the Booster too (with a Kabuki brush) and I like the natural look it gives. 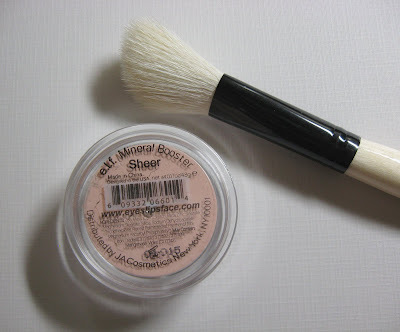 BTW I use concealer brusher for clean-up too :-) and I'm a big fan of their mineral lipsticks! I really love their boosters and glow! Especially the tinted booster. I really love elf products, so far I ordered nail polishes, liquid eyeliners and brushes. the liquid eyeliners are fantastic, I prefer the plum color but the coffee one is cute too. I order from the UK site and never had a problem so far...they ship super fast and send us text messages when the package is shipped. plus there are always fantastic freebies or free shipping costs!! 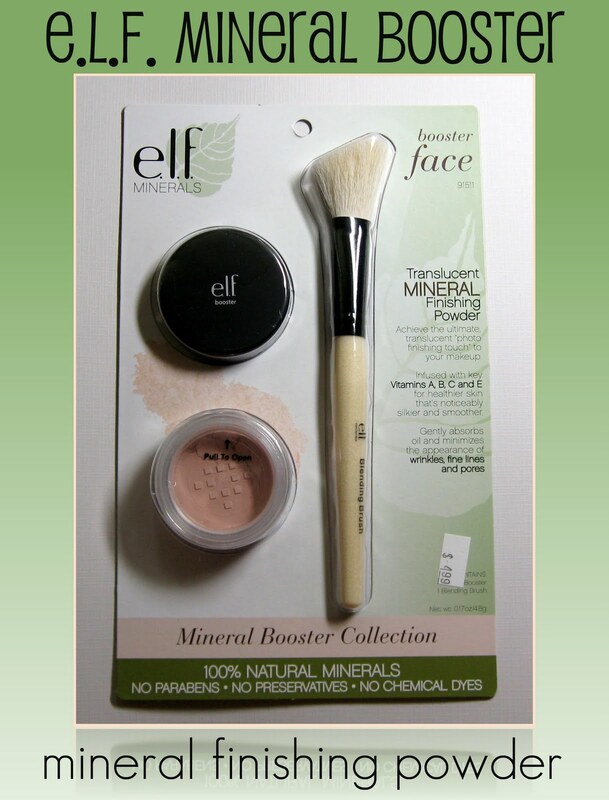 yep I'm an Elf fan because it is affordable and the products I tried are of good quality. Thanks for the review. I had an issue to e.l.f. customer service as well. I do adore their $1 concealer brush...it's the best for cuticle clean up. Interesting that this is such a good product. I've never tried any e.l.f. products. I hate to try a product that's inexpensive and it doesn't work out. Sounds like there's some good products.